This healthy dish is perfect for a winter night when you want something warm and comforting but not heavy. 2) Heat a large oven-safe pot with a lid over medium heat; pour in olive oil and place chicken in a single layer. Cook, turning once, about 10 minutes (or until browned). 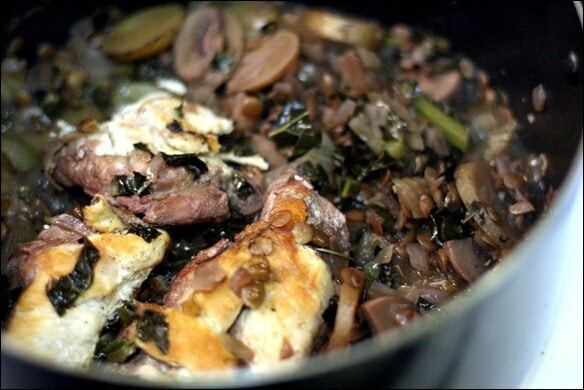 3) Remove chicken and add onion, garlic, and mushrooms to the pot. Cook/stir about 3 minutes. Add wine, water, rosemary, potatoes, and lentils, bring to a boil, then reduce heat and simmer for 5 minutes. 4) Add chicken, fennel, kale, salt, and pepper. Cover pot and place in oven. Cook 30 minutes; then remove from oven, remove rosemary sprig, and enjoy! Add extra salt/pepper to taste, if desired. Check out the original post with more photos/commentary: Braised Chicken with Potatoes, Lentils, Fennel, and Kale. Yammy! Loved this chicken recipe. Looking very delicious. Seems very easy. I will try this tomorrow. Surely you mean “1c chopped potatoes”, not “1c potatoes, chopped”? 1c of potato would likely be just one potato. Same for the mushrooms, measured after chopping? Thanks, I enjoyed this recipe! Mine looks just like your picture. I used more lentils instead of potatoes and increased the liquid a little with some extra water and white wine in addition to the red wine. Sounds great. Any ideas on how to modify this to cook in a crock pot? Maybe just toss it all in and cook on low for 4 to 6 hours? I’m not sure! Let me know if you try it!